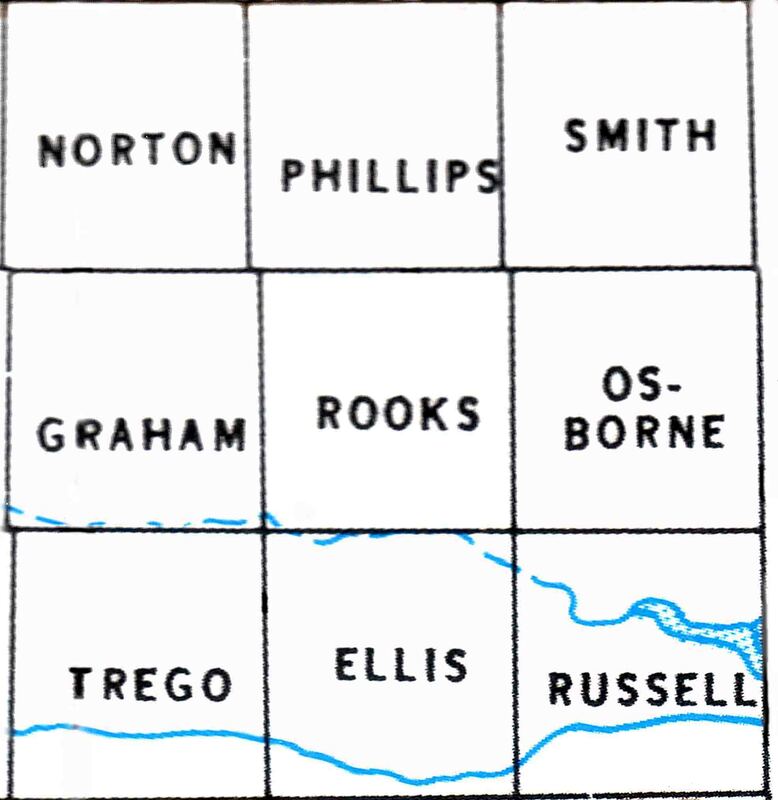 Rooks County was organized in 1867 from the Kirwin Land District and was the only county in Kansas named after a private. The County seat is in Stockton. The County was named in memory of Private John Calvin Rooks of Company I, 11th Kansas Infantry, who died December 11, 1862, at Fayetteville, Arkansas, of wounds received in the battle of Prairie Grove, Arkansas on December 7, 1862. He was born in 1835 in Pennsylvania to John L. and Delilah Rooks. They came to the Weller County, Kansas Territory about 1858. I'm the Rooks County Coordinator, my name is Brenda Reeder, I live in Taylorsville, Utah. Stockton has a very large museum and research facility-the Frank Walker Museum, email them at Museum@ruraltel.net. If you plan a trip to Rooks County, you might want to consider going in April. They hold a unique event, the Speaking Stones Tour. In conjunction with the Arts Council, citizens of Rooks County dress in period costume and stand in the cemeteries at the headstone of a pioneer and talk about their life as if they are the pioneer, it is quite a moving experience. Do you have Rooks County stories, pictures, obituaries, vital records, wills, military records, etc. you would like posted? If so, you can email them to me or send copies snail mail and I will scan them and get them back to you. Let's share what we have! Please see the Submission Guidelines if you scan the photo/document yourself. Links to the KSGenWeb Counties Surrounding Rooks County. Did your family live close enough to the county line that they would have went to another county to get married, to another county's hospital to have a baby, to another county's hospital when sick and died there, or close enough to a cemetery to be buried there? It would probably be worth you time to check out the surrounding counties if you did not find events happening in Rooks County. Are you interested in hosting one of the KsGenWeb orphan counties? If so contact our Orphan County Coordinator who will be glad to answer your questions. Information about the responsibilities of a county host can be found by clicking here. Copyright (c) 2015 Rooks County KSGenWeb. All rights reserved.